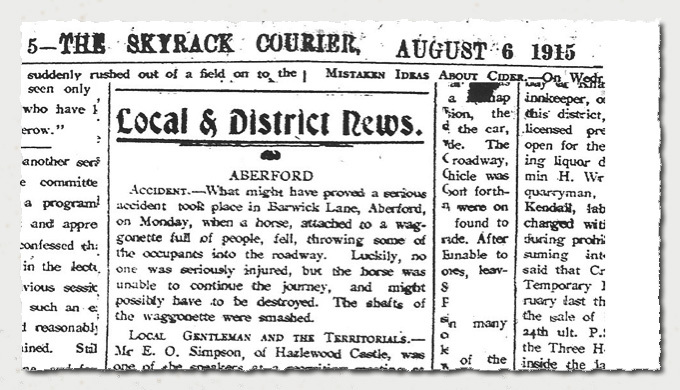 Accident - What might have proved a serious accident took place in Barwick Lane, Aberford on Monday [2nd] when a horse attached to a waggonette full of people, fell, throwing some of the occupants into the roadway. Luckiliy no one was seriously injured, but the horse was unable to continue the journey, and might possibly have to be destroyed. The shafts of the waggonette were smashed. In the Aberford section of the site is a short article about an "Outing", in a similar horse drawn waggonette, here. Lower down the page and of particular interest! The Aberford and District Volunteer Training Corps paraded on Monday for a field day and inspection by Colonel F. R. T. T. Gascoigne, of Lotherton Hall. The company paraded at 11.00 a.m. Under the command of Platoon Commandant Childe, in the absence of Commander T. H. Prater, who was unable to be present owing to the serious illness of Mrs Prater. The number of members of the Corps on parade was about 60, and all wore the official brassard. The men went through various drills and formations preparatory to a march through the village. Lunch was partaken of in the spacious drawing-room at Parlington Hall, and afterwards toasts were drunk to the King, to the Commandant, and to Mr Miller, the instructor. At 2.30 p.m. The men were lined up for inspection by Colonel Gascoigne, who afterwards took the salute. The men went through their evolutions in very smart style, eliciting expressions of approval from the colonel, who in a short address, said he should be doing less than his duty if he did not offer them a word of congratulation on the result of the afternoon's parade. It showed that their heart was in their work, and that they understood that it was their duty to do their utmost towards the defence of their country, if the occasion demanded. He stated that great credit was due to the instructors and officers for the efficiency of the corps, and he was very grateful for the honour of inspecting them. 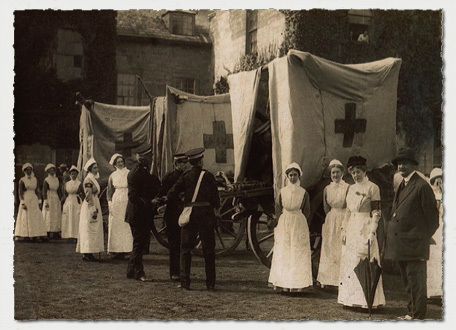 Afterwards the corps were entertained to tea at the invitation of Mrs Gascoigne and Mrs Prater, and others present, in addition to the volunteers, were Mr Lund (Becca Hall), Mrs E O. Simpson (Hazlewood Castle), Col. And Mrs Gascoigne, Mrs Miller and children, and the nurses and wounded soldiers from Lotherton Hospital. After tea a vote of thanks was given to Mrs Gascoigne and Mrs Prater, and the proceedings terminated after a very enjoyable day. Could these be one and the same event? Well perhaps not, but it shows along with other accounts of troop manouvres that the old Hall was regularly used by the Gascoignes' during the First World War, despite already commencing with the removal of parts of the structure. The Porte Cochère was certainly taken away around this time! See picture on the Hall introduction page here, and also troops in Parlington Park on the same page. External Links Associated with the article above.